Movie Star, Horseman, Stuntman, Thrill Seeker! Tommie Turvey is Master Horse Trainer. 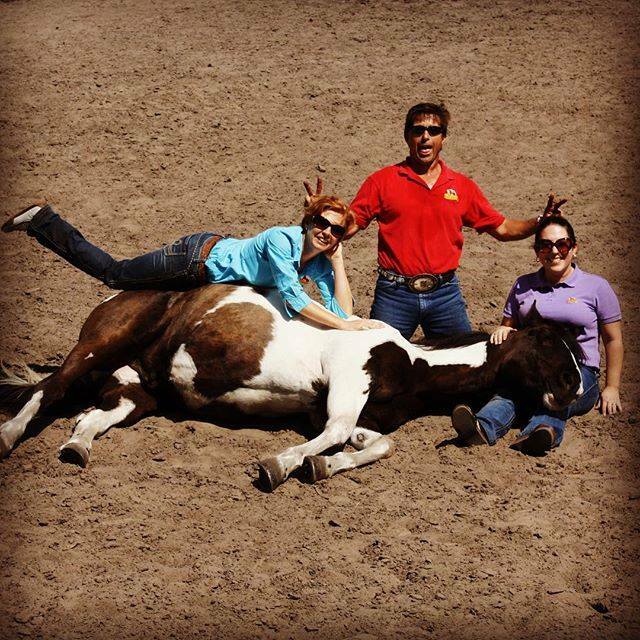 Tommie Turvey has worked in all fields of the equine entertainment industry. Tommie has trained and provided stunt horses for award-winning feature films like; Batman The Dark Knight, Selma 2015, The Walking Dead, Horse Trainer for the #1 Superbowl Commercial of all time. Brotherhood, Dressage Shows, Jumping and Eventing Competitions, The Washington International Horse Show, State Fairs, County Fairs, Circuses, Dinner Theaters (Medieval Times, Buffalo Bills, Arabian Nights), PRCA Rodeos (including Two Time Act of the Year at the National Finals Rodeo in Las Vegas). Episode Name: Get Untacked with Tommie Turvey Movie Star, Horseman, Stuntman, Thrill Seeker! Ice Cube – I’m gonna fight you. Charlie Day – I’m sorry what? Ice Cube – Parking lot. After school. It’s on. Charlie Day – Teachers don’t fight! Maybe the best thing to do is run? Tracy Morgan – I never said nothin’ about no running! Who’s you, Seabiscut? Charlie Day – I am flexing. Man – There’s nothing there. Angelea – So that was you Tommy, and thanks for coming back on the show. I remember when I came to your ranch in Florida in 2012, I just never know what to expect with you, you’re always doing something new. So one thanks for coming on the show welcoming us to your place in Georgia and tell me a little bit about what’s going on with you there. Angelea – At the door? Tell me, wait but tell me what… Ok so we’re live right now and Tommy’s answering us front door, this is great. So anyways, you can go see Tommie in Fist Fight it’s with Ice Cube, Charlie Day, and Tracy Morgan. It’s in theaters right now and I guess Tommie will eventually come back from answering his… wait, he’s in an arena, how do he have a… oh my gosh, oh my gosh that’s awesome, oh my god that’s great good Oh Lord. Tommie – I’m going to have to apologize, it’s their favorite show and they’ve never missed an episode. Angelea – I am so honored, that was that was the best. Like I said, you never know what to expect with Tommie Turvey. So so are we good now? Nobody else is coming to the door? Tommie – We can invite some more people; I have some more dogs if you like. Angelea – No no no! I would I would love to ask you a few questions first [laughter]. So I’ve worked with you before I know what you do, what you do is really unique I think to other horse trainers. I love that you don’t profess that you have all the answers, that you don’t tell people they have to subscribe to a specific program to reach an enlightenment or something. So when somebody comes to train with you at your ranch, besides the unexpected that they’re going to have horses as their audience, what can they expect from coming to train with you? Tommie – That’s really the, see some people come to here and they expect a lot something one thing, and we end up going “wait a minute, that’s not working for you.” or “I got a better idea or different idea that I would like to try”, and people are always a very amazed or surprised they never even thought of that. So I would say like fifty percent of my horsemanship is for everybody, for anybody and everybody, even all levels the highest cause the best people bring the world, he may ride horses but I would say at least fifty percent of my horsemanship would apply… now, does everybody want a bunch of horses to come out and sit on bales of hay? No, but the training it took to get the horses there, the cooperation that it takes, and all of that that is what applies anybody. Angelea – So you are a horseman first and foremost, but we do have a few clips because you are also an entertainer and a stuntman, and actually do this amazing stunt stuff with cars. But we have a few clips that we can roll so viewers can get a little bit of a taste of you on the big screen and in the big arena. Let’s roll that clip really quick and we’ll come back. Angelea – Tommy, that was only a small smattering of some of the films and entertainment that you’ve done, but quite a reel there. So with The Walking Dead stuff I’m sure that you were crazy bombarded with questions, everybody probably wanted to know what’s going to happen next. And when we were looking at the riding instructor video, that had over 6 million views! So besides those two, probably as your as main two things that people want to talk to you about, what are some fun fan moments that you’ve had over the years because you have as crazy amazing follower and fans that just love you to death for great reasons. Angelea – All the smart ones love you! Angelea – you have so many people that go to bat for you and start fighting in comments on Facebook and it’s just like you’ve got some people you’ve got an amazing group of people that have your back because they know [you] and they’ve worked with you firsthand. Tommie – yes and then but I and also I don’t get too offended when somebody does you know question what I do it doesn’t [offend me]. What does offend me is when they start using start being just mean about it. It’s one thing to question someone’s integrity, but to outright challenge them, that’s bad. Blade! Blade, come here! Angelea – So Blade is the horse that was on The Walking Dead right? and Batman. Wait, Blade was on Batman and The Walking Dead? Angelea – was he was he a pretty good horseman after you gave him some treats? Tommie – I’m sorry what was that? Angelea – ok we have you back now you sound great. Or a peach! So you’re saying that Andrew Lincoln was one of your one of your more enjoyable actors to work with? Angelea – Wow! But the opening sequence of that when he rides into town, all of that is you on Blade isn’t it? Tommie – Only the last scene. If you don’t see my face, it’s probably me. Tommy- Well Andrew Lincoln is a great horseman, so we’ll just leave it at that. Angelea – Right on [laughter]. So talking about great horsemen, like all masters of their fields you make everything that you do look easy but I know you had to have had some challenges along your career path. Is there any particular one that comes to mind that you had to overcome in your career as a horse trainer? Angelea – Oh and we lost your audio for a second. Tommie are you back, can we hear you? There we go its just funky technology. We just need to come down to Georgia to visit you in person. So you were saying that when you were sixteen you rode cutting horses? Angelea – oh we lost your audio again. Tommy, can you hear me? Ah, you’re cutting in and out I think we must have… oh you sound great now there we go. Tommie – and the challenges I’ve had to overcome are those people that think that I could only train horses to do tricks. And then the biggest problem that I had to overcome in mind, that’s why too I show the behaviors with liberty and all of that. Liberty is becoming more and more popular, and I knew it would twenty years ago when someone figured out how to teach it. And somebody, a trainer like myself, was willing to teach and show those things to the general public. The reason why I teach liberty is because I believe that liberty is basically communicating with your horse without touching it. So if you’re not touching your horse, you’re given in verbal commands, and you’re also giving him a chance to respond. Angelea – So do you think that that is the root of all training? Like if you can work with a horse at liberty, you can you can build the trust and do just about anything with them? Tommie – the famous ones. When I train my horses, the first number one thing I do, the most natural thing a horse does is run away. So the first thing I teach my horse is to come to, to run to me. And without that first it’s going to be hard to catch, especially after I ride him the first time and I run him around the round pin for 30 minutes and he’s sweating and hot and I put them back out in the pasture, it’s not easy to catch him the next day. So with that in mind, I know that the first thing I train my horses is that Liberty; come to me, come to meet willingly. Now I have a willing participant, now we can build from there. Angelea – Exactly. So I don’t want to put you on the spot, but is there anything – we are in your arena – is there anything fun that you could or would have time to show us? I know we’ve taken up so much of your time already today. Tommie – Okay! [has Blade stand on a block] Can you hear me Angelea? Angelea – I can hear you. Tommie – alright sorry about the technical difficulties, as you can see we are in Georgia, but that has nothing to do with the hillbillies, okay. There’s hillbillies in every state. Angelea – [laughing] And you just happened to be on the top of a mountain somewhere I’m guessing? Tommie – yeah, and we brought him out here for the first time to have him sit down and whenever; that’s the first number one rule, especially on a TV show, you should always practice it before the TV show. That way, during the TV show you can do it. Tommie – Let’s just wing it. Angelea – Let’s just wing it. [laughter] I know it’s going to sound like a stupid question, but when you see him dragging you down and you hit the side of the wall, did that hurt? Angelea – Didn’t you have special padding your body or something? Tommie – I was fully padded with the harness, and again it’s not just about throwing a rope around someone’s leg and dragging him down the hall, that there was my probably my most challenging reason… if you’re a horse person and you watch that show, you’ll notice the horses running on linoleum which is one of the slickest surfaces a horse can run on. And the problem with that is that we could put carpet on the ground, so we have of course we have the things we put on the horses, rubber shoes, same with the Budweiser Clydesdales for traction. Also, it took a while for me to teach the horse; they wanted a horse off the track, thoroughbred off the track, that’s why I had Sunday here I just happened to have bought him for another show that I did called Sunday horse, that’s why I named him Sunday, for the lack of a better name. But since then, Sunday is 10 years old now and we’d love to find a job for him, that’s why he’s for sale. He’s a great hunter jumper prospect, anything prospects really. Angelea – And he’s a movie star. Tommie – Ten-year-old thoroughbred off the track… an auction on your show here, but he’d make a phenomenal anything for anybody. He’s also in The Walking Dead, and he does not get eaten. Angelea – a horse on The Walking Dead that does not get eaten, that is an exceptional event. So he’s a very special horse, so what we’ll do is we’ll put in the comments below on Facebook will put the comments where they can reach out to you. Also, actually you also are hosting a clinic at your farm, what is it March is it 10th 11th and 12th no? And so folks can come and ride with you at your farm, I’ll put them in the comments below for the Facebook page I’ll put tommyturvy.com and a little bit of information about that. and I know we’ve taken up so much of your time this morning, and you have tons of stuff to do so I’ll let you go. I want to thank you, I want to thank your crew, I want to thank all your horses, especially the audience that are fans of HorseGirlTV, for coming on the show today, I really appreciate it. Tommie – Thank you again; Angelea you’re not taking up my time, one of my favorite things to do is to show people how talented horses can be, and also that they too can do it. You might not be able to do everything my horses do, but I’ll find something for you and your horse to do that’s really cool. Angelea – Right on. Well, one thing is maybe we can get the awesome folks that made this really great production possible, at SpaldingFlyPredators.com, I’m going to put a bug in their ear, maybe they can get us down there to you in Georgia and we can shoot some fun training stuff with you there. Tommie – we’ll go roam and ride. Angelea – We will tell that story next time we talk, it was my misconception but I ended up having a blast roaming and riding with you, so thanks so much Tommie I really appreciate you guys, have a great day! Tommie – Thank You Angelea have a good one. Angelea – Thanks. I’m Angelea Kelly, you’ve been watching HorseGirlTV and, HorseGirlTV live, and we will see you next time.